This is a delightfully dish to create with your grandchild or child. Lucy, Leo and I had great fun making this dish for a school project on chocolate! 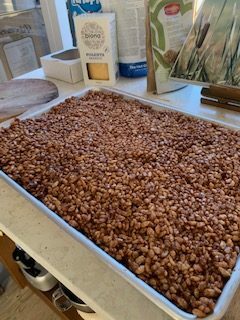 Rice crispies drizzled with white and dark chocolate, heaven! 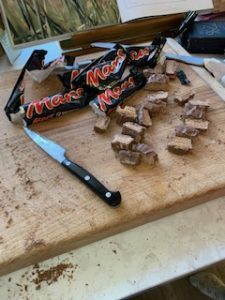 In the US, Mars bars are known as Milky Ways. on, until the mixture is melted and bubbling, 3-5 minutes. 2. Pour the mixture into the rice crispies, stirring with a large spoon. 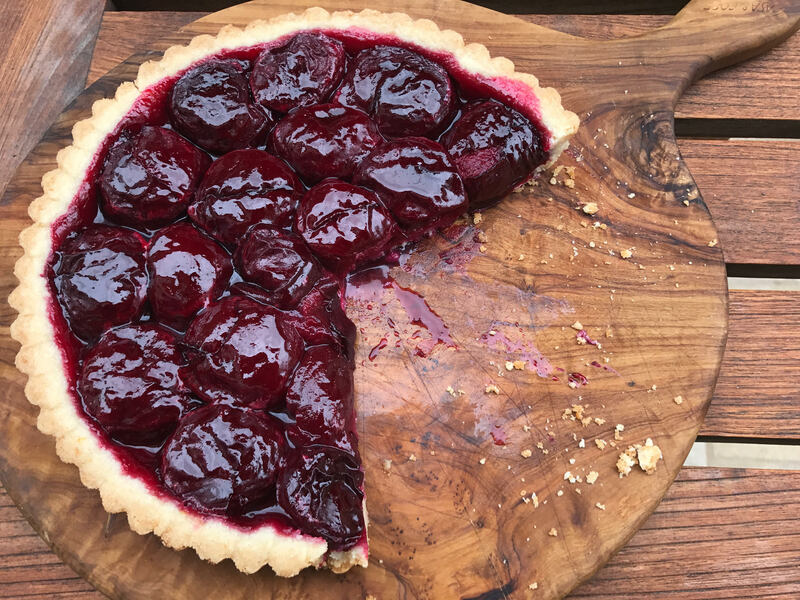 While still warm, spread this on the baking sheet as an 8-inch/18-cm square about ¾ inch/2 cm thick, flattening the top with the spoon and straightening the edges. Leave to set, 8-10 minutes. 3. For decoration: heat a small saucepan of water until almost boiling. Break one of the chocolate bars into squares, put them in a bowl and set it over the steaming water. Heat until the chocolate is melted, stirring occasionally, 5-7 minutes. With a fork, drizzle the melted chocolate over the crispie mixture in fine trails and leave to set, 8-10 minutes. Repeat with the other chocolate bar. You will have some chocolate left over. Chill the decorated slab of delights until firmly set, at least 30 minutes. 4. Trim the edges of the mixture with a large heavy knife. Cut it in 2-inch/5-cm squares. Store the delights in an airtight container, layered with parchment paper or plastic wrap. They will keep for up to a week. 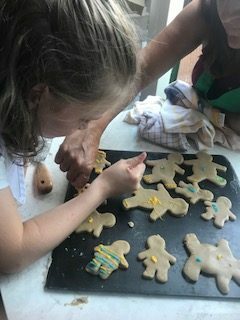 Gingerbread men are the ideal Christmas recipe to occupy a wet afternoon. They can be cut small to hang from ribbons on the tree, or pack in gift bags for the neighbors.. When larger they form a protective army around the Christmas cake. 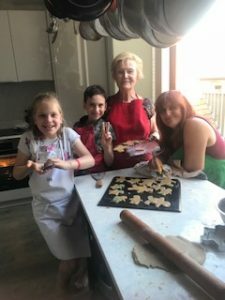 At Simon’s Mas in the Roussillon near Perpignan where we all spend the holidays, the five grandchildren — four girls and boy — join around the big kitchen table. We take one very English ingredient with us — the essential golden syrup which makes the dough easy to knead and roll as well as the characteristic sweetness that is so different from brown sugar. 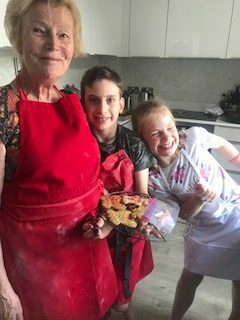 A lovely photo of Lucy, Leo, Maxine (the wonderful Nanny) and Myself in my kitchen. d chill until firm about 30 minutes. Heat the oven to 400ºF/200ºC and set a shelf near the center. Butter two baking sheets. Turn the dough into a floured work surface and cut it in half. Roll one half to about 1/8 inch/3 mm thickness. Stamp out gingerbread men with the cookie cutter and set them on the baking sheet. Decorate them with the icing pens, marking faces, hands and boots, with currants for buttons. Chill in the freezer until firm, 10-15 minutes. Meanwhile press the dough trimmings into the remaining dough, roll, shape more men, set them on the second baking sheet and chill. Bake the gingerbread men in the oven until golden brown around the edges 7-8 minutes. Transfer them too a rack to cool. Gingerbread men do well in an airtight container for up to a week. You can see here the differences in size and colour. Look in the window of the shop, usually one that specialises in pastry rather than bread. 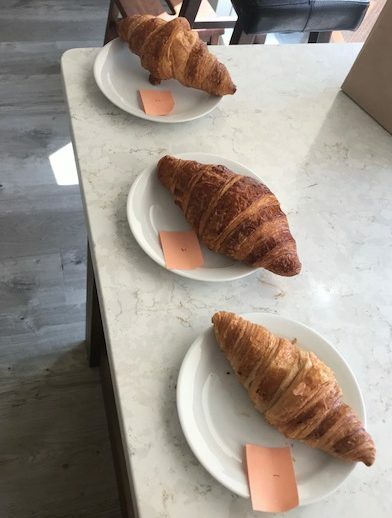 The smaller the size of the croissants, the better. Less is definitely more! Price: I usually pay is £2/$ 4.60 for a croissant, i.e. the middle market where croissants range from 95p to £3. Colour: Is it tempting and golden? If pallid it will be soggy, if too dark and over baked it will be dry. Layering: can you see how the croissant has been constructed, a glimpse of the tale-tale layers which make up the structure of croissant is always reassuring. Shape: it is lop-sided in the structure/in the bake. Note that in France a straight rather than a crescent shape indicates the use of margarine (and a lower price). A good rise: if a croissant looks deflated, it has not been proved (i.e. left to rise) enough, or it has been over proved – the latter problem is common in hot weather. Is the point well sealed and tucked under the rolled croissant before it is shaped as a crescent on the baking sheet? 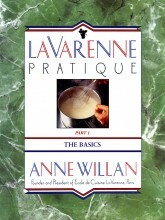 If not, the dough will unravel as it rises in the oven and the croissant will collapse. A sketch to show how the point is sealed. 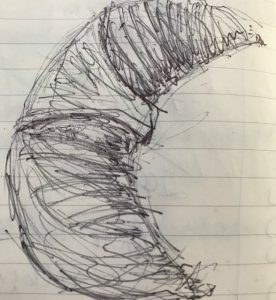 Lightness: if sticky, the croissant is under baked. Aroma: when you break open the croissant can you smell the butter and heady, yeasty dough? 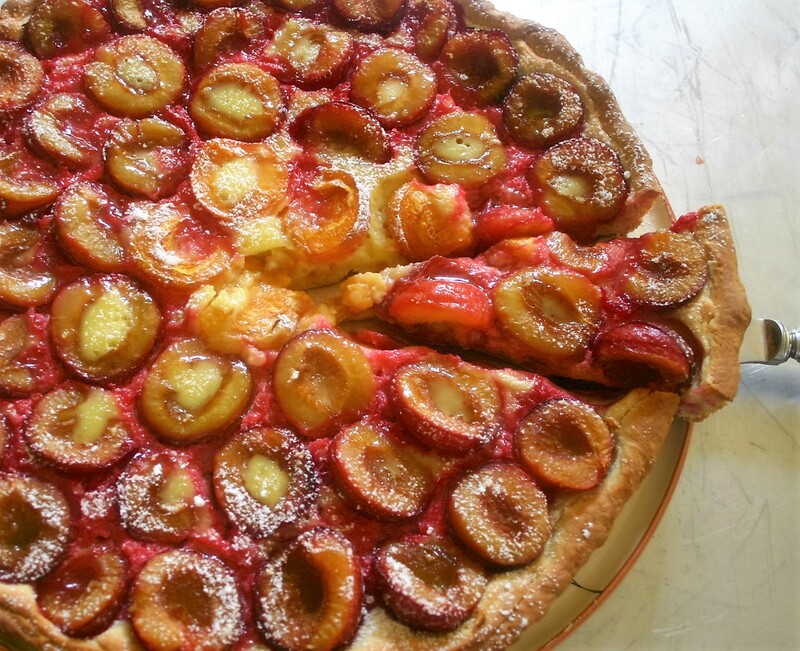 Holes: big holes indicate dough that has risen too long before baking. Chewiness: a good baked croissant is chewy without being tough. Fluffiness: not a good sign, the dough was poorly kneaded. Flavor: should be buttery with only a whiff of yeast. Having the right, generous amount of butter is key. A true French croissant has a delicious taste which is hard to match outside France. The flour is different and so, above all, is the butter. I hope this description has aids you all in this challenging search. All that is missing is a steaming café crème. 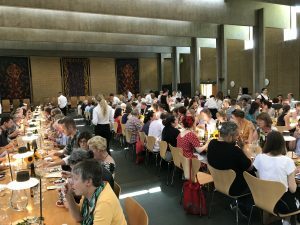 This July I returned to the annual Oxford Symposium on Food & Wine at St. Catherine’s College, Oxford. The conference is academic in nature and the theme for 2018 was on “Seeds” I am neither gardener nor farmer and the topic was not my forte. So naturally, my interest turned to the food! 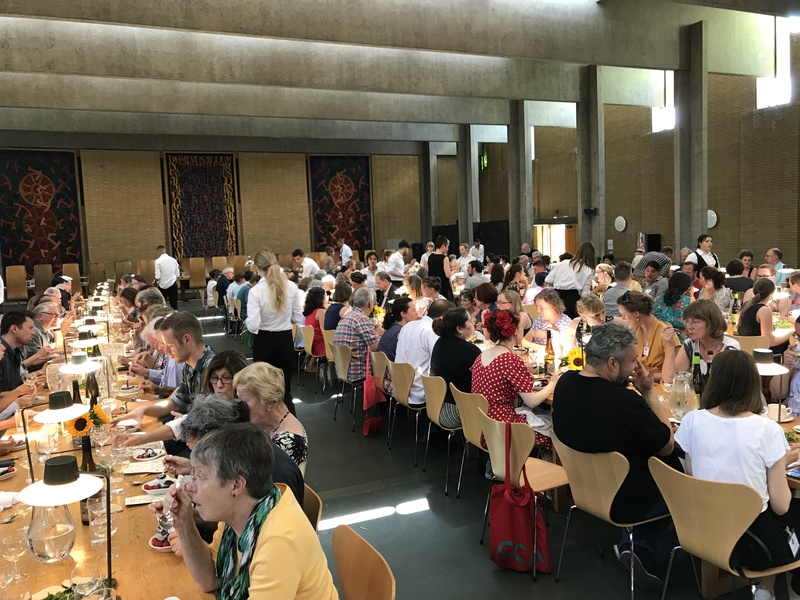 The Symposium is well-known for its intellectual meals served banquet-style in the dining hall of St. Catz, as it’s called. The whole college complex is a modernist historic landmark designed by Danish architect Arne Jacobsen. At the last lunch, there was a fantastic array of specialty breads: rye, spelt, corn, barley, einkorn, all sustainably sourced from the local bakeries, the menu Borough Market, The Sustainable Food Story Soup-er seeded. The desserts were inventive: spiced poached rhubarb, sheep’s milk custard, sorrel meringues, toasted buckwheat crumbs, and coconut milk rice pudding with berries. Salads presented the diversity of the chicory family, demonstrated by its many fantastically named varieties: blue dairy, blue dandelion, blue sailors, blue weed, bunk, coffee weed, cornflower, hendibeh, horseweed, ragged sailors, succory, wild bachelor’s buttons, and wild endive. Pick your favorite. The Symposium was full to the brim, showing its continued popularity more than three decades on. Lectures I attended focused on grains, primarily the origins and manipulations of historic versions of modern wheat, whether it be how Mexico and Pakistan use the same wheat seed or tracing the origins of wild emmer wheat in Israel/Palestine in a captivating lecture by Dr Assaf Distelfeld of Tel Aviv University. 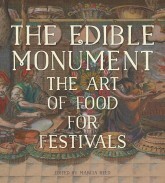 Elizabeth Hoover & Sean Sherman’s lecture on the movement to re-establish Native American indigenous food culture. She’s a Brown University professor and he’s the Sioux Chef. 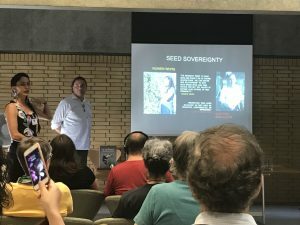 Other fascinating lectures included Myriam Melchoir’s talk on the history of maize in Brazil and David Sutton’s talk on Amaranth, the bushy purple plant that popped up all over my mother’s garden, in the wilds of Yorkshire, thanks to her love of exotic plants. Anny Gaul gave a fascinating lecture on the seed fenugreek, most commonly used as a spice in Indian and Middle Eastern cooking. I’d only known it in curry mixes but her talk was how prosperity led Moroccan middle-class home cooks to shun fenugreek’s pungent aroma to the extent that it disappeared from all but rural home cooking and is now being re-discovered as an authentic flavor of North Africa. I’ve already marked next year on my calendar where the subject sounds a challenge: “Food and Power”, we all learn that in the nursery. Many, many thanks to all who were involved with the organization of this event, and I thoroughly look forward to next year. For more information about the Symposium click here. 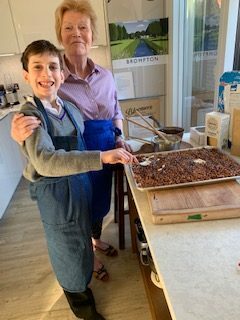 After school on Friday’s my 11 year old grandson Leo and I have time together. 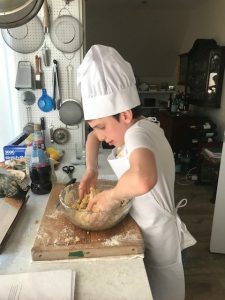 This past week we prepared for his father’s birthday celebration, which naturally meant making an abundance of Leo’s favorite cheese balls! Cheese balls come from my Aunt Louie, who with piled white hair and a brave bos om, who would drive down the village street bowing right and left to her friends in the manner of the Queen Mother. Aunt Louie was lucky. Her tombola tickets invariably won a prize, and once earned her a valuable diamond brooch in the shape of a bow as pioneered by Cartier. I have it to this day. We have Aunt Louie’s cheese ball at nearly every family occasion and now I’m passing along the tradition to the next generation. Butter a baking sheet. Turn the crumbs into a bowl, press them into balls the size of small walnuts and set them on the baking sheet. Chill for 30 minutes and heat the oven to 375˚F/190˚C. Bake the cheese balls until lightly browned, 20 to 25 minutes. They keep well in an airtight container, or they can be frozen. 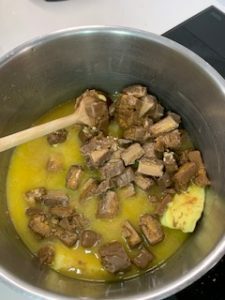 A delicious bite for dinner parties and a great way to entertain my Leo. This June I was very honored to be awarded the Lifetime Achievement Award by the UK Guild of Food Writers. I’m grateful to be invited to join such a rarefied group of food writers who have already received this award. 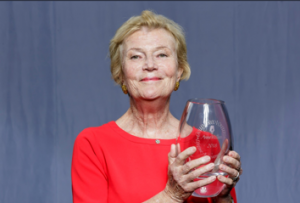 If you’d like to watch my acceptance speech at the Guild of Food Writers Awards at Opera Holland Park, London, click here. 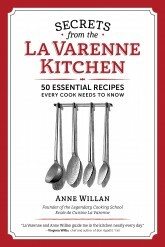 Now that I’m settled in London I’ve joined the London Les Dames d’Escoffier chapter and I’m deep into working on a new culinary history book, which traces the evolution of the American cookbook through key works all written by women authors, and I’m enjoying being closer to my family, teaching my grandchildren in the kitchen weekly. @babsi3 @TheIvyWestSt I am very well Barbara, how are you? Copyright © 2014 Anne Willan Inc., All Rights Reserved.